How to file GSTR-1 from Sleek Bill Online? (trial and premium users) - How can we help? Note: If you are Free user of Sleek Bill Online you will have to upgrade to a Premium account to be able to file reports straight from the app. To file your GSTR-1 faster you can do it straight from Sleek Bill. Now, click on the button that says "Sync Data to LegalRaasta" (this is our GSP partner that helps us and you to upload your GST reports details faster to the government website). If you are a Free user you will have to upgrade to a paid Premium plan to be able to upload your GSTR-1 straight from Sleek Bill. You can still export the GST Report to your email and upload it yourself to the government website. Your account on LegalRaasta has now been created and you will see a screen that shows you when your data is synced. When your data is Synced you can login to LegalRaasta and start filing your report. To login to your recently created LegalRaasta account, just click on the dark grey box that says : "Login to LegalRaasta". 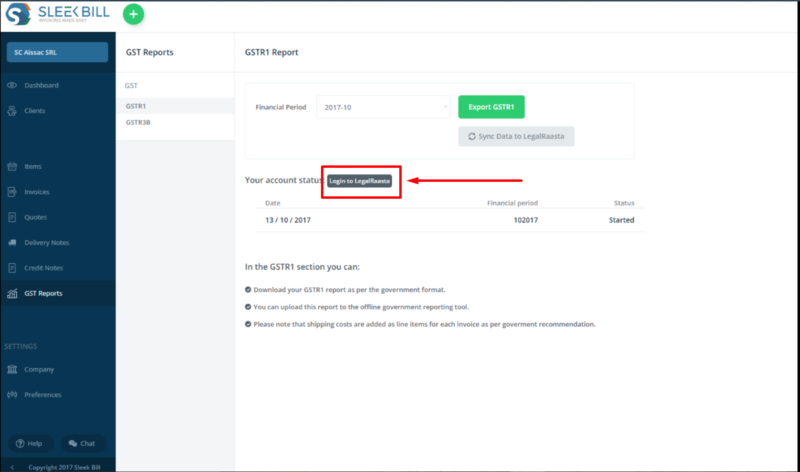 In your LegalRaasta account just click on "Work on GST return" to start working on your report. After this you will see a screen with GSTR-1 Filing sections. If your invoices and other documents had all the correct details in them you should see green check marks ✓ in front of each field and you can proceed by clicking on "File" . If there are any errors in your data you will see red exclamation marks ! . (as you can see from the pictures) . Go into each section that has errors, verify the data and then File your report. Note: If you are Premium user you can file 1 GSTR report per month for FREE. 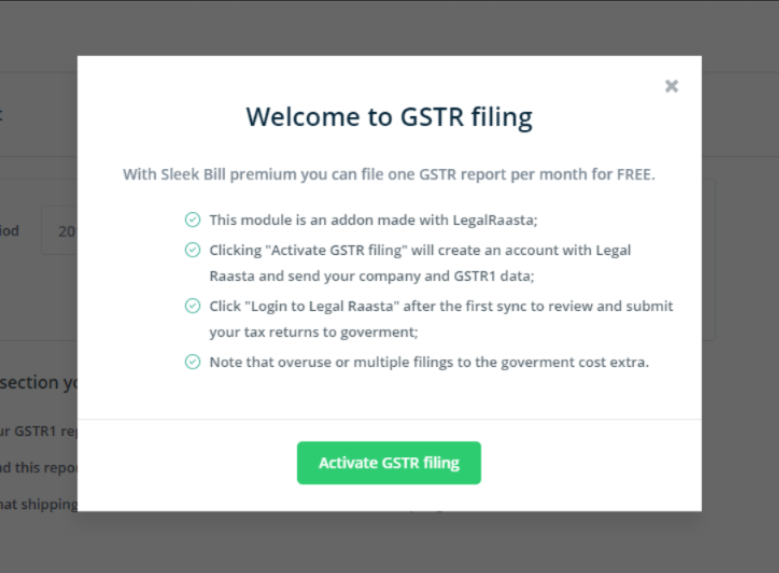 If you wish to file other GSTR reports in LegalRaasta or file more than 1 report from Sleek Bill Online, you will have to pay extra.